DTC Products, St. Charles, IL, has introduced a new and improved version of its slug-retention machine. 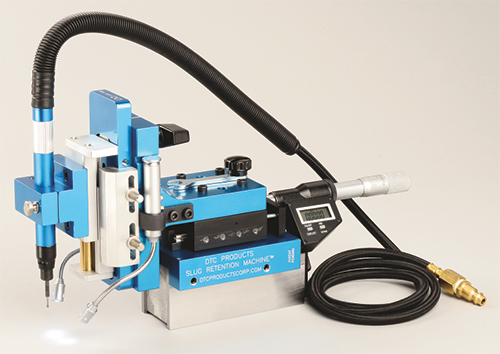 The device uses a pneumatically powered grinder to precisely machine a small, angled groove into the sidewall of the die cavity in a stamping die. The groove prevents slugs from pulling onto the die surface where they can damage the sheetmetal strip, the stamped part or the stamping die itself. • A grinder-head adjustable depth stop to control the grinder’s depth into the die cavity. Each of these features helps the operator quickly and more accurately position and control the grinder position. In addition, DTC has made the grinder assembly adjustable to three height positions, ½ in. apart, enabling it to work with a wider range of part thicknesses; and has changed the lights to flex lights so that the operator can position the light and clearly see into the cavity, providing better visual inspection of the work area. The groove produced by the grinder is 0.025 to 0.127 mm deep and machined at an angle of 3 to 5 deg. to the die surface, which creates a precise amount of slug interference. During stamping, slugs expand into the grooves so that they do not pull out of the die cavity. The machine measures 4 in. wide by 14 in. long by 8 in. tall. A magnetic base allows it to be mounted temporarily but firmly in place on the die surface during the grooving operation. See also: DTC Products Inc.